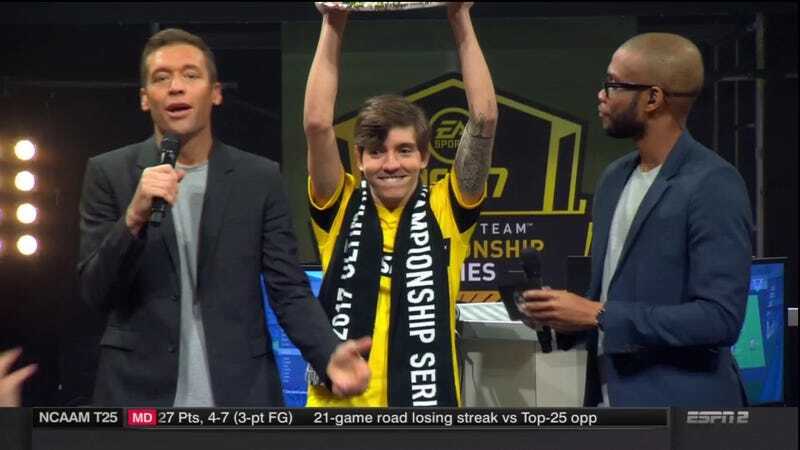 Rafael “Rafifa13" Fortes took home the title in this weekend’s Miami Regionals in FIFA Ultimate Team, beating LucasRep98 3-1 and earning a spot in Berlin for the Championship Finals. The Regional finals, broadcast on ESPN2, showcased the two platform winners playing against each other. Fortes, who hailed from the Xbox division, continued his platform’s reign of dominance over PlayStation, who have yet to win a Regional final. Guess that solves the console debate forever, right? After a ceremony, Fortes got a chance for some photo ops, including one with a certain Chad “Ochocinco” Johnson. Both Fortes and Lucas have booked a ticket to the Ultimate Team Championship in Berlin, where they will compete for a prize pool of $400,000. Maybe some of the PlayStation players will start shopping for Xbox bundles before the big tournament.